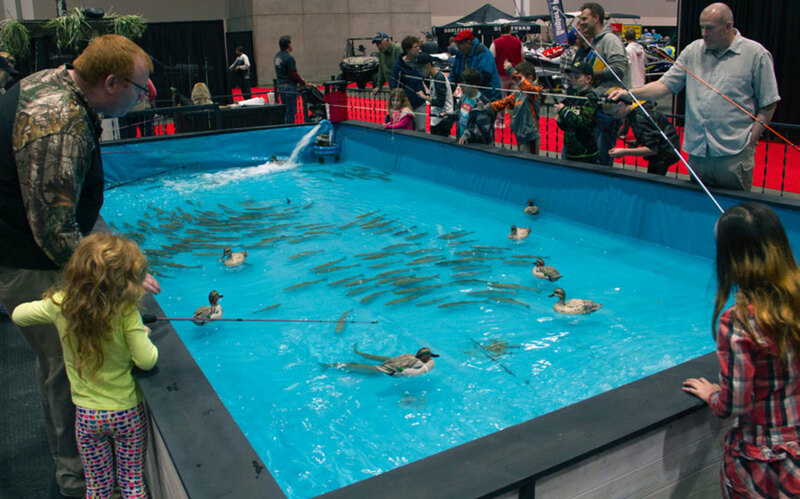 The trout pond at the Kansas City Boat & Sportshow is a draw for families. The Progressive Atlanta, Kansas City and Nashville Boat Shows open today. All will have four-day runs. The Progressive Atlanta Boat Show in Hall A of the Georgia World Congress Center will feature 600 boats. The show is also featuring a houseboat, book readings to children from anchors of the local news station CBS 46, and will be putting together a Career Day Jan. 11 for students and adults interested in a marine career. The show will also have “Boats & Brews with Red Hare Brewing” on Thursday and Friday night, according to the National Marine Manufacturers Association. The Progressive Kansas City Boat & Sportshow opens today at Bartle Hall, filling 270,000 square feet with more than 300 boats, outdoor gear and the latest marine technologies. Returning to the show after a hiatus is the famous DockDogs Competition. Boats & Brews is also returning for the second year Friday night, with a tasting flight from Boulevard Brewing Co. The Progressive Boat Club will have its Oculus Rift virtual-reality experience that simulates a virtual boat race, plus educational seminars and a pond with remote-control boats. The organizers have written a remote guide for parents. The Progressive Nashville Boat Show will open at the Music City Center. Beyond the boat and equipment exhibit, the show will have a star appearance from Twiggy the Famous Waterskiing Squirrel. Its first-ever Super Thursday will feature a special visit from country star Walker Hayes. Family activities include a Discover-A-Boat tour where kids can receive prizes for making different stops along the Show floor.